Have you ever had redness, swelling and scaling with painful cracking at the corners of your mouth? Then what you had experienced is a condition medically termed as angular cheilitis. Although you may be having these symptoms and seem you got a serious disease, you must not worry because it is not uncommon. Cheilitis is a broad term that describes swelling of the lip surface manifested by dry scaling and fissuring. It has four types namely atopic, granulomatous, actinic, and angular, which is the main focus of this article. Angular cheilitis, derived from the words “cheilo” which means “lips” and “itis” meaning inflammation, is indeed an inflammatory condition that involves one or both angles of the mouth. It is usually seen in primary care settings and may occur spontaneously although; there are a lot of predisposing factors to its development. 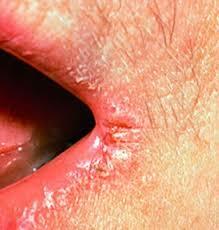 Other terms synonymous with this are perleche, angular stomatitis, and commissural cheilitis. Once you have this disease, it can also change your life not just physically but also psychologically. The reasons behind it will be tackled in the articles to come. This condition may be acute if early treatment occurs but, it can also be chronic with its recurrence and may last from a couple of days, months, and up to several years. Patients at first may tend to think that this condition is self-limiting and will just go away on its own and this causes it to worsen. This is the reason why many articles about cheilitis can now be found on internet, health magazines, and books because the more we know about it, the earlier we will be able to recognize it. Use of a barrier cream at night is an excellent deterrent; if you use lip balm, buy a new one every month.